If you’re like me and cannot bear to be apart from your dog for more than five minutes, then this story is going to make you leap with joy. So many times, I’ve heard that it’s disgusting to let your dog sleep in the bed with you, because let’s face it, they’re not the most hygienic. However, a scientific study has found that the key to having a good night’s sleep, is having your dog right next to you in bed. The study looked at adult women and their sleep quality and routines, which looked at over 960 participants. 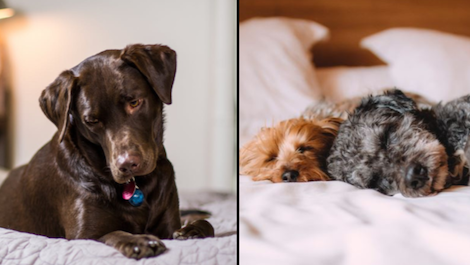 57% of the women who took part said that they although they share their bed with their dog, they also share with their partner. However, the women then went on to say that they sometimes kick their partner out, as they’re too disruptive to sleep with, whereas with their dog, it’s like a dream. Shortly after this study, a similar study was conducted on our furry friends, which also look at their sleep quality. This study found that dog’s like to be called a good boy, having lots of pats and a cuddle before they go to sleep. Even more surprisingly, the study also found that if a dog has lots of stressful thoughts sometimes, such as a where the ball disappeared to, they have a big struggle getting to sleep – just like us! I didn’t think dogs could get any cuter. So, next time someone tells you it’s dirty to share a dog with your best friend, just tell them about this study and prove them wrong. You and your fluff ball will be the ones laughing after having the best night’s sleep ever! Do you reckon dogs are the best companions to have? Do you sleep in the same bed as your dog? Let us know in the comments or on Twitter at @WhatsTrending.